Kronomyth 2.0: Aw, hell diddly ding dong crap. 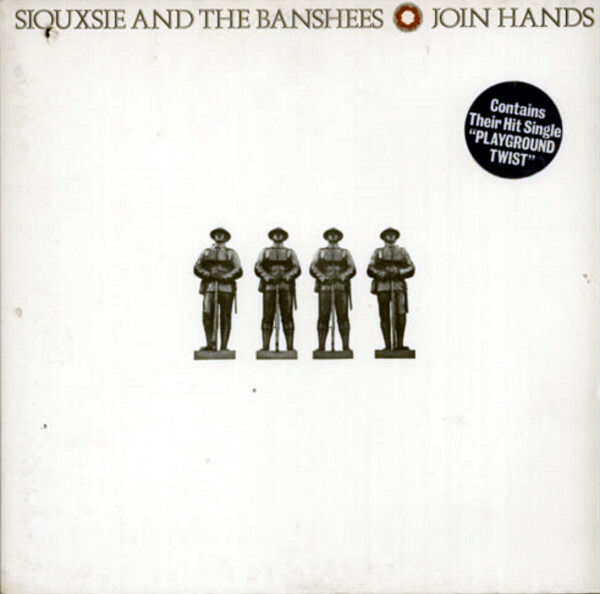 Second albums usually suffer from the shortcomings of writing new material quickly, in which case you might see a fourteen-minute version of “The Lords Prayer” as a crutch but, if that’s the case, Siouxsie and The Banshees plainly intend to beat you over the head with said crutch. Join Hands cements Siouxsie’s status as a peerless gothic punk priestess/poetess. No one—not The Cure, not The Damned, not The Clash, not whatever remained of The Pistols—was making music this bleak, bloody and intense. The band is absolutely uncompromising in their vision and yet, God bless their black hearts, English audiences strapped themselves in for the ride and followed the Banshees down the dark, dark corridors of this brutal art gallery. The album again opens with a stunner, “Poppy Days,” which borrows bits of John McRae’s war poem, “In Flanders Fields,” and immediately turns our attention away from the land of the living and its bright, happy colors. “Regal Zone” is even darker, imagining a torture scene in a kingly court of apathy/duty where brutality is the cost of policy. “Placebo Effect” pictures a young girl at the unfeeling end of uncaring physicians, and you begin to notice a pattern: horrible things happen through people in power and the powerful institutions they wield. As if building up to the fight, Siouxsie and The Banshees tackle the most powerful people/institutions at the end: Mom/Dad and God. As the last album from the original quartet, Join Hands marks the end of the band’s darkest phase. John McKay and Kenny Morris set the template for what would follow—guitars as broken shards of metal nightmares, pounding drums—but the band was less monochromatic in execution after they left the group, for whatever reason. Honestly, it’s unlikely that Siouxsie and The Banshees could have sustained this level of intensity for long. Join Hands is a very intense record. It never relaxes, never admits any trace of warm sunlight in its subterranean world. When “Playground Twist” is the happiest song on your album, you know you’ve entered a dark place. As with the early Cure albums, Join Hands contains few memorable melodies. The songs are certainly deliberate, the overarching theme clearly a planned construct, and so what emerges is less a collection of their best ideas and more a perfecting of their sound and vision in carefully staged vignettes. It’s not an easy album to rally around any more than Seventeen Seconds or Faith, works that were obviously influenced by The Banshees’ first two records, but it might be the most principled piece of art they’ve ever produced. All titles written by Siouxsie Sioux, John McKay, Kenny Morris and Steve Severin unless noted. John McKay (guitar, saxophone), Kenny Morris (drums, percussion), Steven Severin (bass guitar), Siouxsie Sioux (voice, piano). Co-produced by Nils Stevenson and Mike Stavrou; engineered by Mike Stavrou. Outer sleeve photography by Adrian Boot. Illustration by John Maybury. Design by Rob O’Connor. Released on elpee and cassette on September 7, 1979 in the UK (Polydor, POLD/POLDC 5024) and Japan (Polydor, MPF-1267) with gatefold cover and lyrics innersleeve; reached #13 on the UK charts. 1. Re-issued on compact disc in 1989 in the UK (Polydor, 839 004-2). 2. Re-issued on compact disc in 1992 in the US (Geffen, GEFD-24047). 3. Re-released on expanded, remastered compact disc in 2007 in the UK (Universal, 9840726) with 2 bonus tracks. 4. Re-released on expanded elpee in 2015 in the Netherlands (Universal, 4718729) with one bonus track (“Infantry”) and unique cover. 5. Re-released on 180g vinyl elpee in 2018 in Germany (Universal, SATBLP02).